【昆虫】 シャクガ 《成虫》; シャクトリムシ 《幼虫》. 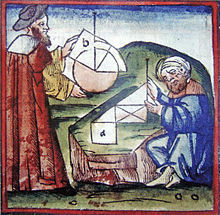 Ultimately from Late Latin geōmetra, from Ancient Greek γεωμέτρης (geōmétrēs), from γῆ (gê, “earth”) + μετρέω (metréō, “to measure”). A mathematician who specializes in geometry. (zoology) Any species of geometrid moth (family Geometridae).